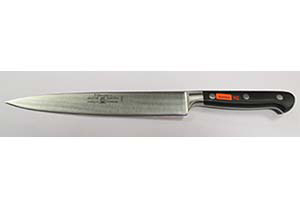 Professional, long kitchen knife for cutting meats, fruit & vegetables. Blade length: 8in / 20cm. Forged from one piece of special chrome-molybdenum-vanadium steel, and laser controlled blade shape provides ergonomics and perfect balance. Knife is durable, solidly made and hand, neatly sharpened. Riveted handle in a new generation of polymer POM, providing its shape and finish.